A Chance to Watch The Florida Everblades · Let's Go Amerks! If you’re like us and start planning hockey road trips early, you may be interested in marking your calendar for Wednesday December 3, 2008 when the Florida Everblades will be nearby to play the Elmira Jackals.Â It’s the only game scheduled between the two teams.Â Elmira is a roughly two hour drive from Rochester. The Florida Everblades are affiliated with the Florida Panthers.Â Typically if the Panthers are required to callÂ a player up from the AHL they will replace that player with a prospect they have with the Everblades.Â Early in the 07/08 season the Panthers called Tyler Plante up from the Everblades and sent David Schantz down.Â Also towards the end of the season players Kenndal McArdle, Peter Aston, Franklin MacDonald, and Adam Taylor had been reassigned to the Blades to assist with there playoff run. We’ll be keeping an eye on playersÂ with the EverbladesÂ in the ECHL more during the coming season. 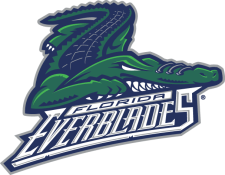 The Everblades are also affiliated with the Carolina Hurricanes (NHL), Albany River Rats (AHL), and the Plymouth Whalers (OHL).